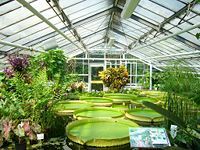 In botany, a greenhouse or glasshouse is an enclosed structure that typically is covered primarily with glass, plastic, or fiberglass, and that provides a controlled environment (temperature, humidity, ventilation) for growing plants. Greenhouses often rely on at least partial heating by the sun and generally provide a means of cultivating young, tender, or out-of-season plants by protecting them from excessive cold or heat. Greenhouses may range in size from a small shed with a few plants to a large building, perhaps covering hectares (multiple acres), and known as a hothouse or conservatory. The development of greenhouses involves the creation of a management process whereby plants can be grown under optimal conditions maintained even under external conditions normally unsuitable for those plants, such as winter environments. A greenhouse in Saint Paul, Minnesota. A greenhouse typically is a structure with a glass, fiberglass, or plastic roof and, frequently, walls, supported by a frame constructed of aluminum, steel, or wood. At least some of the heating comes from the sunlight, i.e. solar radiation, passing through the glass, fiberglass, or plastic and warming the air and interior surfaces (plants, ground, structures). The warm air is retained in the building by the roof and wall and the radiant energy absorbed by the interior surfaces is re-radiated at a longer wavelength that is now blocked by the glass, plastic, or fiberglass cover, which is transparent to the shorter wavelength incoming sunlight. The greenhouse cover can be described as a selective transmission medium for different spectral frequencies that serves to trap energy within the greenhouse. As solar radiation warms the air near the ground, this air rises, but is prevented from flowing away, as is demonstrated by the drop in temperature achieved by opening a small window near the roof of a greenhouse. This principle is the basis of the autovent automatic cooling system. Greenhouses thus work by trapping electromagnetic radiation and constraining convection. Miniature greenhouses are known as a cold frame. Greenhouses protect crops from too much heat or cold, shield plants from dust storms and blizzards, and help to keep out pests. Greenhouse effects are often used for growing flowers, vegetables, fruits, and tobacco plants. Bumblebees are the pollinators of choice for most greenhouse pollination, although other types of bees have been used, in addition to artificial pollination. Besides tobacco, many vegetables and flowers are grown in greenhouses in late winter and early spring, then transplanted outside as the weather warms. Started plants are usually available for gardeners in farmers' markets at transplanting time. Special greenhouse varieties of certain crops, like tomatoes, are generally used for commercial production. Greenhouses are increasingly important in the food supply of high latitude countries. The largest greenhouse complex in the world is in Willcox, Arizona, U.S., where 262 acres (106 hectares) of tomatoes and cucumbers are grown entirely under glass. Light and temperature control allows greenhouses to turn non-arable land into arable land. Greenhouses can feed starving nations where crops cannot survive in the harsh deserts and arctic wastes. Hydroponics can be used in greenhouses, as well, to make the most use of the interior space. Biologist John Todd invented a greenhouse that turns sewage into water, through the natural processes of bacteria, plants, and animals. Backyard hobby greenhouse use has increased dramatically in the United States in the past decade. Companies such as Rion, Solexx, and Juliana have introduced entire lines of backyard greenhouses for use by the hobby gardener. Major retail establishments, as well as small niche players, sell hobby greenhouses primarily over the internet. Backyard hobby greenhouse use is still more popular in Europe and England, however. The idea of growing plants in environmentally controlled areas has existed since at least Roman times. The cucumber was a favorite of Roman emperor Tiberius, who "was never without it" (Pliny the Elder 77 C.E. in Bostock and Riley 1855). The Roman gardeners used artificial methods (similar to the greenhouse system) of growing to have it available for his table every day of the year. Cucumbers were planted in wheeled carts, which were put in the sun daily, then taken inside to keep them warm at night under special conditions (Pliny the Elder 77 C.E.). The cucumbers were stored under frames or in cucumber houses glazed with either oiled cloth, known as "specularia," or with sheets of mica. The first modern greenhouses were built in Italy in the sixteenth century to house the exotic plants that explorers brought back from the tropics. They were originally called giardini botanici (botanical gardens). The concept of greenhouses soon spread to the Netherlands and then England, along with the plants. Some of these early attempts required enormous amounts of work to close up at night or to winterize. There were serious problems with providing adequate and balanced heat in these early greenhouses. Jules Charles, a French botanist, is often credited with building the first practical, modern greenhouse in Leiden, Holland, to grow medicinal tropical plants. Originally built on the estates of the rich, greenhouses spread to the universities with the growth of the science of botany. The British sometimes called their greenhouses conservatories, since they conserved the plants. The French called their first greenhouses orangeries, since they were used to protect orange trees from freezing. As pineapples became popular pineries, or pineapple pits, were built. Experimentation with the design of greenhouses continued during the seventeenth century in Europe, as technology produced better glass and as construction techniques improved. The greenhouse at the Palace of Versailles was an example of their size and elaborateness; it was more than 500 feet long, 42 feet wide, and 45 feet high. 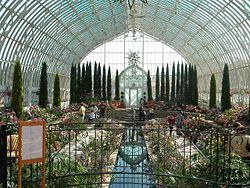 In the nineteenth century, the largest greenhouses were built. 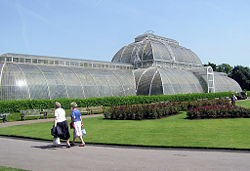 The conservatory at Kew Gardens in England, is a prime example of the Victorian greenhouse, although intended for both horticultural and non-horticultural exhibition. These included London's Crystal Palace, the New York Crystal Palace, and Munich’s Glaspalast. Joseph Paxton, who had experimented with glass and iron in the creation of large greenhouses as the head gardener at Chatsworth in Derbyshire, working for the Duke of Devonshire, designed and built London's Crystal Palace. A major architectural achievement in monumental greenhouse building was the construction of the Royal Greenhouses of Laeken (1874-1895) for King Leopold II of Belgium. In Japan, the first greenhouse was built in 1880, by Samuel Cocking, a British merchant who exported herbs. In the twentieth century, the geodesic dome was added to the many types of greenhouses. Lemmon, K. 1963. The Covered Garden. Philadelphia: Dufour. Muijzenberg, E. W. B. van den. 1980. A History of Greenhouses. Wageningen, Netherlands: Institute for Agricultural Engineering. Pliny the Elder. 77 C.E. The Natural History. Book XIX. The Nature and Cultivation of Flax, and an Account of Various Garden Plants. Chapter 23 (5), Vegetables of a Cartilaginous Nature—Cucumbers. Pepones.. Edition and translation by J. Bostock and H. T. Riley, 1855. Retrieved September 28, 2007. Vleeschouwer, O. de. 2001. Greenhouses and Conservatories. Paris: Flammarion. ISBN 208010585X. Woods, M. 1988. 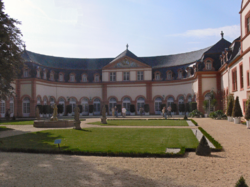 Glass Houses: History of Greenhouses, Orangeries and Conservatories. London: Aurum Press. ISBN 0906053854. This page was last modified on 14 July 2017, at 23:20.